Pizzas are great as they can be made with whatever you have in the pantry, or the fridge, and the following are some suggestions for when you have unexpected visitors, or if you want a very tasty casual meal. It is also a way to get children to eat vegetables, as they are often "hidden" when cut finely and cooked. You could also put grated vegetables in the dough which children do not usually taste! I also like my bases thin, and then I can make them to my liking if I make my own dough. For the children's pizza, I microwaved some cut up pieces of pumpkin and mashed this and mixed it with the pizza sauce (as they do not eat vegetables). I then spread this on a base, and added the ham, lactose free cheese (or no cheese), and some pineapple if using - these children preferred the pineapple on the side, uncooked! Bake some small pieces of pumpkin in the oven adding a bit of oil and balsamic vinegar for about 15 minutes on about 185°. Spread the remaining pizza bases with the pizza sauce, using half or one small packet per base, depending on size of bases. Then add grated cheese, and any of the following: mushrooms (sliced); browned bacon pieces, English spinach, baked pumpkin, feta, and pineapple. Add some cheese on top if desired, and bake for about 10 minutes. Slice into 4 or 6 pieces and serve. Another suggestion for a pizza is to spread the base with the pizza sauce, add grated cheese, baked pumpkin, feta cheese, olives, bacon, and cooked chicken. Then add some more grated cheese, and cook for about 10 minutes in a fairly hot oven. 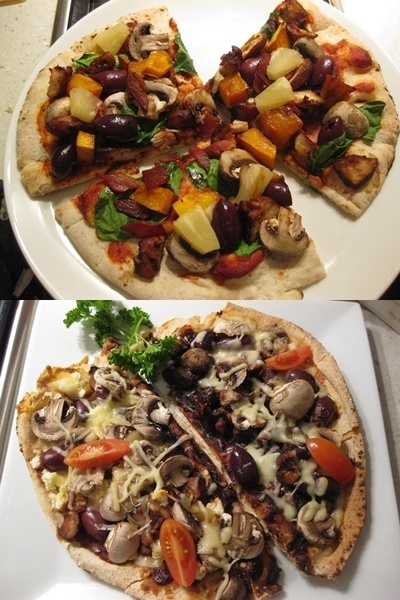 These pizzas are so versatile as you can put so many different combinations on the top, and limited only to your imagination, and foods that go well together. It is the ability to mix and match that makes these pizzas so enjoyable, and you can make half - half if one person does not like something you want to put on.